Christmas Festival in Priego, Cuenca (Spain), December 22nd, 2013. This past December 22nd, we celebrated a Christmas Festival in the Cultural Center of Priego, Cuenca (Spain) organised by the Servant Sisters of the Home of the Mother. All the citizens of the town were invited to attend the act and, in fact, the hall was filled with people. This year, the main act of our festival was a performance in which the protagonists were nine actors (youth and young adults), plus two women who also put in their comical note. 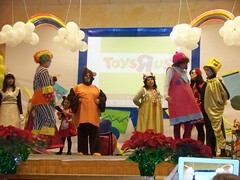 Moreover, a group of children who were dressed up as gifts brightened up the set. Our presenters were also two youth of Priego. Miriam Ferrer, member of the Home of the Mother who has a long experience as presenter whenever it is needed, and Gabriel, a promising student of journalism who is very gifted in the communications field, accompanied by an excellent radio voice. As you see, we had great presenters for our show. The play was set in a toy shop in which the actors were toys who turned alive when the store owner was not looking at them. 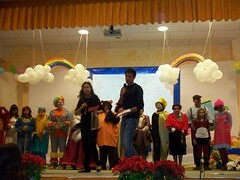 A rag doll - acted by Marta Torrecilla - was the toy that was rejected and forgotten about, and who did not find any meaning to her existence nor had motives for being happy in Christmas. A clown, a teddy bear, a Cinderella, Mary Poppins, Christmas lights, and Monopoly tried to reason with the rag doll to find the meaning of Christmas, showing that her joy proceeded from the gifts, travelling, celebrations or Christmas food. Nothing would change the sadness of the doll until a harlequin finds the answer. With the Word of God he goes decifering the true meaning that brings joy to the heart of every human being. Jesus is the Gift that we can all receive. 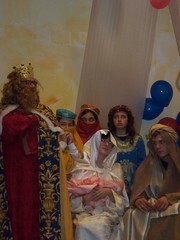 The end of the play consisted in a living manger scene that showed the true protagonist of Christmas. The play was animated by several songs with choreography, finishing with a tender song to the Child Jesus that the rag doll sang. In other moments of the play, the audience had the opportunity to laugh. We must say that one of the three kings failed us in the last moment and we had to improvise by dressing up a spontaneous person. Our Christmas festival had some intermissions, during which we projected some short videos that reflected the Christian charity in Christmas and that moved many hearts in the audience. For example, a bar owner told us afterwards that one of the vidoes had impressed him so much that, when he arrived home, he searched for it on the internet and projected it all afternoon in his bar. Another of the intermissions was the performance that Carmen did (the grandmother of the presenter of the festival). She acted out a Christmas monologue with great skill and talent that made us all laugh. And lastly, we raffled off a big Christmas basket (elaborated through the generosity of the people of the town who collaborated by giving food items of all kinds) and a picture of the statue of Christ of the Charity. 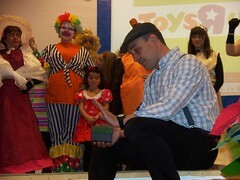 The profit of the raffle was destined to help needy families in the town. From this community of Servant Sisters we give thanks in first place to God for helping us to carry out this festival and so be able to continue enlightening this society that wants to shut out the Christian light of Christmas. We also give thanks to all those who have made the performance possible with their participation, with the costumes, and with their prayer. We wish a Merry and Holy Christmas to all of them and to all who are reading these lines.